In this week's column, Jane Anson sees the vineyards at the Bardenas national park, where Bordeaux varieties are growing in desert conditions. 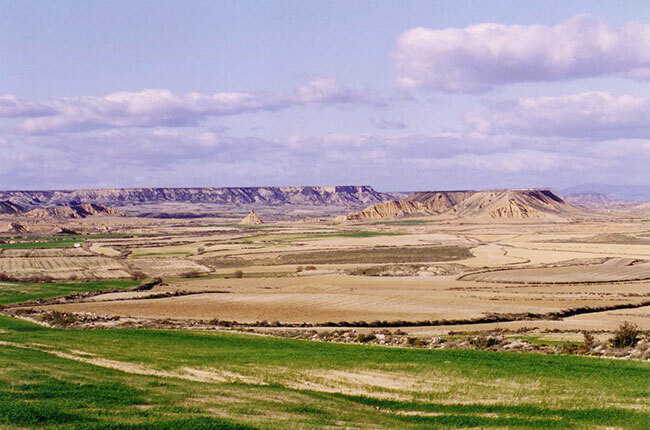 This week, Game of Thrones is filming its sixth series in the Bardenas National Park. My guess is that not many of the 8 million viewers, or even the 1,200 extras drafted in for filming, will have heard of this UNESCO-protected, semi-arid, desert in Navarra, northwest Spain. But for those who have, the decision makes perfect sense. The desolate landscape of the 42,000-hectare Bardenas Reales could be in Mexico, Nevada, Egypt, Tunisia, Mars… (or even Essos, Game of Thrones fans). Single-track roads lead you to canyons, plateaus and sun-baked rocky crags rising out of the sand. It is hard to believe that this martian landscape, whipped by wind and erosion, sits just over an hour from the verdant Pyrénées Mountains. A couple of Clint Eastwood spaghetti westerns have been filmed here, as has a recent Duniya Soori Bollywood musical and a host of Spanish thrillers. If you want to explore it for yourself, there is only one hotel that gets you really close. The Aires de Bardenas sits just back from the dusty track that leads into the park. It is as stark and dreamlike as the surrounding badlands, with old fruit crates forming the outer walls of the carpark and swimming pool. And if you head just a little further along, as the desert landscape takes over and the cracks in the sun-parched earth start to widen ominously, there is a vineyard. The first time I saw it was a ‘slam-on-the-brakes’ moment. Vines are, as we all know, hardy and stubborn plants. They like to grow where other vegetation takes flight. But few places bring this home more brutally than seeing them thriving and healthy on the edge of the Bardenas desert. The vines themselves were unmarked, but enquiries in the area told me that they belonged to Bodegas Viña Magaña, a highly-regarded estate established by the Magaña family in the early 1960s at this southeastern edge of Navarra. They are not the only vines in the Bardenas Reales, although not many are quite so closely implanted to the sandstone heart of the place. The monastery wine of Abadia de la Oliva is a neighbour (the oldest continually operating winery in Spain, with 900 years under its belt), as is the biodynamic, and truly excellent, Bodega Azul y Garanza. For all of them, growing in the Bardenas means facing conditions not found elsewhere in Navarra. Besides the obvious impact of sunshine and water shortages, there are huge variations in temperature between night and day, easily 15 degrees centigrade, often much more. This means low yields, small grapes, high concentration, with a freshness and balance that comes from this diurnal swing. Old vines help, but these vineyards will inevitably be part of any future debates about farming in an increasingly water-challenged world. There are water channels here, with streams criss-crossing the landscape, but the flow is irregular and most streams remain dry for the majority of the year. Irrigation is allowed, but is used sparingly, with owner Juan Magaña preferring to do it only if conditions are particularly dry, and then only when the vine is first sprouting, then at flowering, then for a final time at veraison. Historically, Garnacha was the grape of choice in the water-parched soils of southern Navarra, although today Tempranillo has overtaken as the most popular planting. Viña Magaña chooses neither of these varieties for its Bardenas vines (although it does for other sites). Instead you find, growing cheerfully among these arid soils, international favourites of Syrah, Merlot, Cabernet Sauvignon and Malbec, all of which are blended – sometimes with the traditional varieties – into the spicy, fragrant and powerfully structured Magaña Dignus. And there is a suitably cinematic story – or possibly an equally impressive tall-tale – for how they first came to be here. Juan Magaña was the first in Navarra to plant Bordeaux varietals, and reportedly bought the Merlot clone #181 from Pétrus in the 1970s. At the time the planting of international varieties was banned in Navarra (Syrah and Malbec are still not theoretically allowed), so Magaña smuggled his precious clone over the Pyrénées mountains. He followed these with Cabernet Sauvignon cuttings from the Médoc. ‘We have very old Tempranillo and Garnacha in our other vineyards plots,’ he told me via email this week, ‘but the sunshine and the terroir of the Bardenas gives a powerful concentration to the French varieties’. The concentration was met by an equally impressive freshness when I tasted it last week with, for me, the Syrah taking precedence over the Merlot in terms of taste profile. I tried the 2012 vintage of Magaña Dignus, alongside their other wines, and found that the dried fruit, heat-soaked qualities I would expect in a desert wine were entirely absent. Yes there was alcohol (14%), but a bright minerality gripped and cradled the fruit, and a powerful spiciness pulsed alongside. Just one thing though. I hate to ruin a perfectly excellent story, but I did call Jean-Claude Berrouet, venerable winemaker of Pétrus who was working at the estate in the 1970s, to check out the parentage story. He told me that they have never sold any clones of Pétrus. Moreover, no clones were planted in the vineyard until the 1980s. However, wherever the vines came from (I have asked the question, and will report back when I get a definitive answer), but most likely they came from a nursery in Pomerol that supplied young plants to many of the greatest local estates, including Pétrus, they are certainly among the oldest clones of Merlot in Spain, planted 42 years ago, with nine hectares in production. And they seem perfectly at home in this hidden, hauntingly beautiful desert landscape. Update 24/09/15: Bodegas Viña Magaña confirmed to Jane Anson that the clone came from Pomerol, and was bought from a French Nursery.